You’re bored at home and spend the time you do send messages without sense via Twitter. It’s time to look for the funny side of microblogging network, through games behind it. Today we introduce a fun and original. 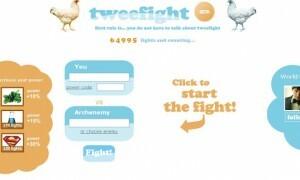 It’s TweeFight, where you can face with your friends and see who the most popular in Twitter. Just simply write the two names of users and wait for the result. If you want more interesting, each one can choose a famous twitterer and face them, to see who has more influence on Twitter, in a battle that becomes quite addictive and will provide hours of fun. If you’re competitive, you can buy items that will increase your power. For example, for $0.99 USD, you can acquire the power of spinach, which will raise your ranking by 15% for ten fights, although there are other more powerful and expensive. What you expect shows who is the strongest in TweeFight.